Buying gold online via BullionVault remains the cheapest way to buy gold at the current spot price and store it securely. Commission rates start at 0.5% maximum falling to a minimum of 0.05% depending on the amount of gold bought or sold in the year. Storage and insurance is 0.12% per year on gold (billed monthly) and subject to monthly minimum of $4. 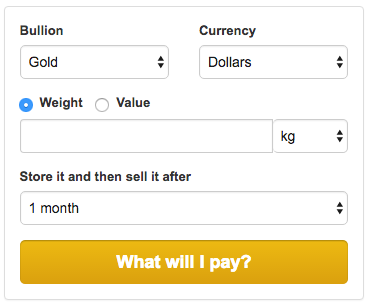 Even with the low fees it’s still a bit of a pain to work out what the fees and storage rates are, so BullionVault now provide a calculator to easily calculate commission and storage fees. Weights are rounded to the nearest 0.001kg, which is the minimum trade amount at BullionVault (And one gram being the most logical unit of measure). So if you are mathematically-challenged when it comes to working out fractions of percentages off the top of your head, then refer to this handy calculator.